Voters who have never read a party platform are told that to cast a vote on principle is to “waste your vote.” The verifiable fact is: your spoiler votes for Libertarian Party candidates repeal bad laws. Today’s example is a woman’s right to undo her unwanted pregnancy. How was that right asserted and made law? LP Candidates were John Hospers and Tonie Nathan. Ours was the first viable party to field a lady candidate for vice-president and secure for her an electoral vote–12 years before the Dems finally followed our lead. 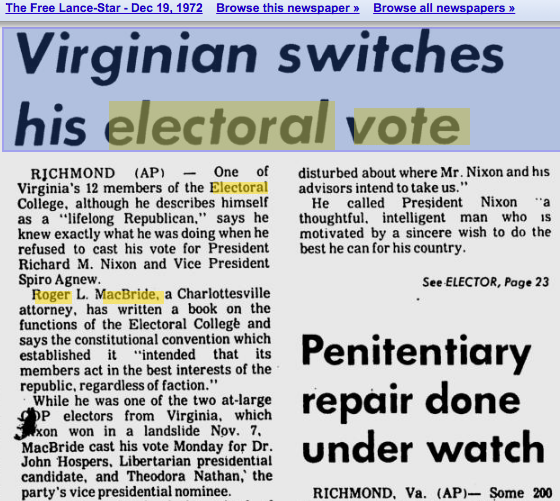 The popular election was 7 November of 1972, and electoral votes were counted in December. That most important part of the Supreme Court decision was a perfect logical paraphrasis of the Libertarian plank on abortion. Much effort was expended to distance the decision from the first three words of the 14th Amendment: “All persons born…” These three words speak to the rights of individuals, but were NOT the reason the court struck down coathanger abortion laws in states notorious for mystical bigotry. The Supreme court was manned by five Republicans and three Democrats, and had been mulling this case since the first baby steps toward organizing a Libertarian Party. Already the LP.org was against military conscription–which coerced 58,000 Americans to their deaths in Vietnam, formerly a French opium regie. But the Supreme Court had already committed to that version of slavery and involuntary servitude for WWI. Republicans–white and Christian like the Germans who voted for National Socialism–were terrified. Republicans feared not communism, essentially the same thing as nationalsocialism, but the “activated atheism” they associated with the Communist faith. Republicans had reason to fear that the widows and girlfriends of the boys they’d sacrificed were ready for bloody vengeance at the polls. Democrats had ditched the Klan and voted Wet in the 1932 economic collapse, and made out very well. So Democratic Justices again betrayed Southern mystical bigotry by copying the Libertarian plank, as Dems had copied the Liberal party repeal plank to defeat Herbert Hoover and elect FDR. Nixon had tried to crush the LP within 24 hours of its formation by using the IRS to bribe the media with tax money. That politician took office, gingerly stepping over the scorched relics of the usual looter opposition–Socialist, Socialist Labor, People’s, Prohibition and Communist party–but fearing the 3674 Libertarian votes. Those votes have since grown a thousand times and now total 4 million. Since 1971 the Libertarian Party has been the prime mover for deregulation, repeal of censorship, defense of individual rights, non-entanglement in foreign affairs and the general increase in freedom. We are the reason God’s Own Prohibitionists finally backed away from coercing gay voters before the recent election–and the appeal to laissez-faire has also spread to more than 20 countries. The only brutal dictatorships left on earth are governments that block libertarians from organizing into political parties. Think about that next time someone is tortured or beheaded. If you were pleased with the clarity of this expository writing, consider www.portugueseinterpreter.com to help you get ideas across the language barrier in three directions.